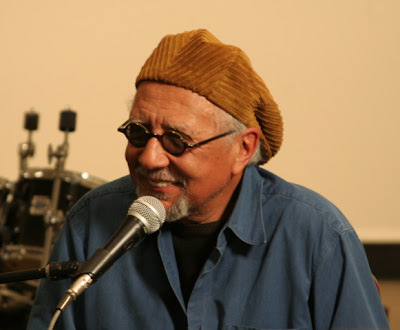 In one of the most highly anticipated events of this year’s Monterey Jazz Festival, Charles Lloyd reprised Forest Flower, the recording he made at Monterey in 1966 that sold a million, catapulted him to fame, became the soundtrack of the Flower Power movement, and drove him into the woods at Big Sur for more than a decade. It wasn’t until the 1980s that he came out of musical retirement, and he has graced us with numerous recordings since, most recently Sangam, recorded live in Santa Barbara. Earlier on Saturday, journalists and photographers were treated to a private Q&A with Lloyd. Moderated by Andrew Gilbert, a freelance writer whose articles about jazz frequently appear in the San Francisco Chronicle, the conversation proved as freewheeling and adventuresome as Lloyd’s playing. Lloyd reflected on the loss of Billy Higgins, the drummer with the beatific smile who was Lloyd’s great friend and spiritual brother: “Master Higgins told me he often dreamed we played Forest Flower while flying on our backs.” Higgins died in May 2001 but is still very present in Lloyd’s life. Lloyd believes that Higgins guided him to Eric Harland, the drummer in his current quartet. It happened during a September week in 2001. Lloyd was in New York City, scheduled to play the Blue Note starting on Monday, September 11. We know what happened on that day. Lloyd began his Blue Note stand on Friday, September 15, with the first in a series of free concerts meant to give New Yorkers hope. Later that night, he heard Harland play in a jam band. “I knew Higgins sent him to me,” Lloyd says, “because of that radiant smile.” Sangam is their first recording together. It’s a trio effort with table master Zakir Hussain, and a tribute to Billy Higgins. Thankfully, he does play it, and we’re grateful. This time, Geri Allen is at the piano, queenly in a red silk caftan. Eric Harland is fierce and beautiful on the drums. Rueben Rogers mans the bass; sometimes a single note from his instrument is all we hear, and it’s enough. Lloyd’s saxophone whirls and caresses; his flute dances, as does Lloyd himself, standing behind Harland while the others play. Is this music really 40 years old? It doesn’t sound dated. And it doesn’t sound modern. It’s music of the moment, and the forest flower blooms again. P.S. The Arena at the Monterey Jazz Festival is very large. Thoughtfully, the Festival provides a giant screen and plentiful close-ups. Kudos to the camera operators, who almost make you forget you’re sitting hundreds of feet away from the stage.